(Before) This lady attended our practice in pain after being told at her own practice that there was a 6 month waiting list to be treated. She required an amount of work including multiple extractions of back teeth and prolonged periodontal (gum) treatment. 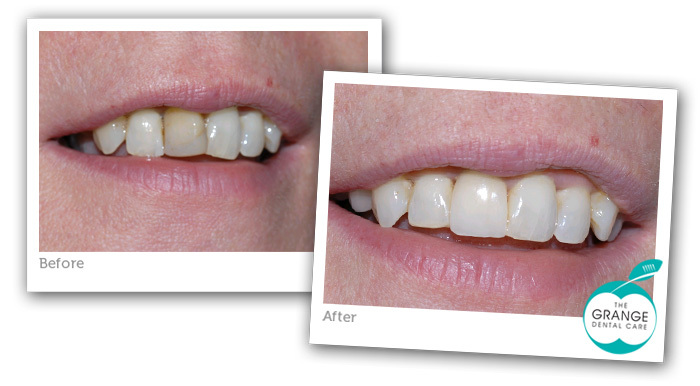 Once the gums had healed we whitened her teeth, provided some bridges to replace the teeth she had missing and placed a non-metal crown on her upper right front tooth. The treatment took 5 months. The week that the treatment was completed her old practice contacted the lady to offer her an initial appointment!